So happy to bring you a review today of the Holiday trio from Black Dahlia Lacquer, a brand I have been eyeing for some time, their beautiful bottles caught my attention on IG and I have been dying to try them ever since. Yes! I am a packaging sucker. What can I say? I love pretty things and these bottles are pretty and elegant and the polish looked amazing! 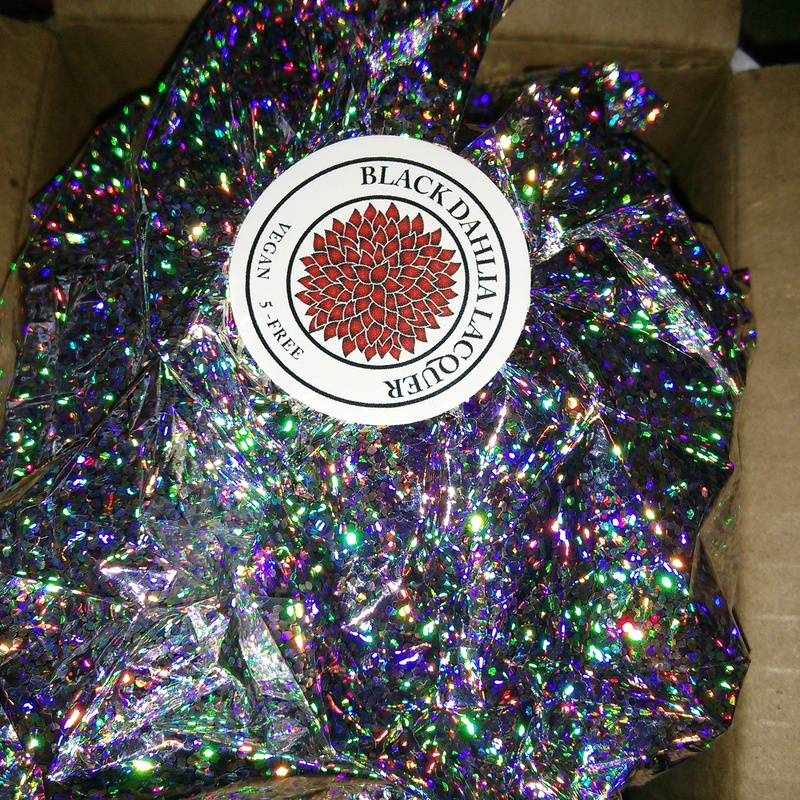 Never in my wildest dreams did I think it would come wrapped up in the prettiest holographic wrapping paper it did! Wow! It was like early Christmas. I was so excited! When I opened the Package I was even more in love with them! 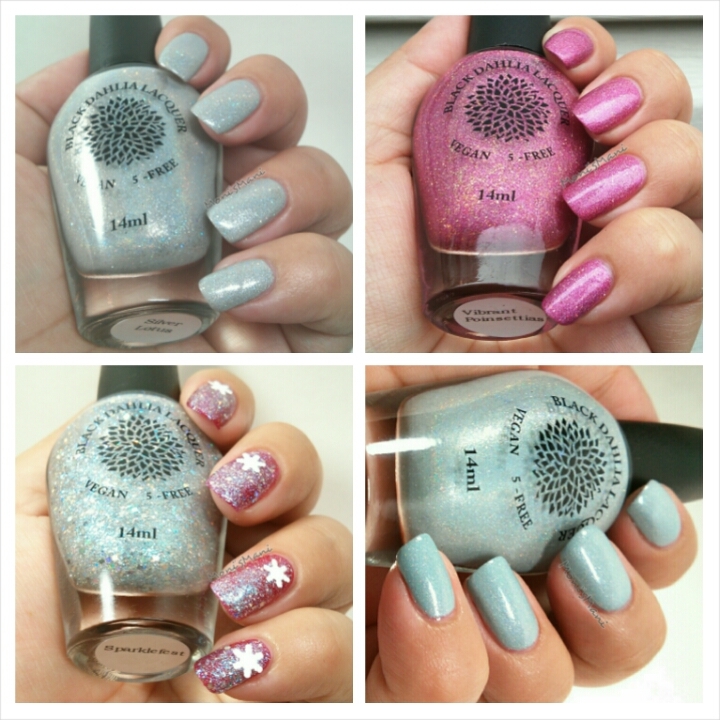 I was sent the Holiday trio and a re-released glitter called “Sparklefest”. Let me introduce them to you one by one. *Texas Ice Flower: is a “pale turquoise shimmer with blue glass flecks, silver micro glitter and a subtle linear holo finish” as described by the maker. This polish is indeed a beautiful pale blue. It was a snowy day when I put it on and it was just perfect for the occasion. *Vibrant Poinsettias: is a “shimmering red leaning pink with light and dark gold micro glitter, red glass flecks and the appearance of a scattered holo finish” as described by the maker. This polish is GORGEOUS. I had it on two days and I could not for the life of me do it justice in pictures. The holo, the glass flecks, the shade itself make for a beautiful combination. This to me is the star of the trio and a polish I would buy over and over again out of fear of it running out. Yes, I love it that much. Just look at it! *Silver Lotus: is a “shimmering silver micro glitter with a subtle linear holo finish” as described by the maker, at first glance it might look a little too much like Texas Ice Flowers but when you put them side by side the difference is noticeable (silver lotus on the bottom in comparison pic). I find this to be a great option for the polisher looking for non-foil looking silver; it is subtle but has a little kick to it. *Sparklefest: is a “top coat filled with silver holographic glitter of different sizes in both squares and hexes and loaded with blue shimmer” as described by the maker. This baby is an iridescent beauty! Very pretty and easy to manage and use in nail art. You see a very subtle gradient on top of Texas Ice Flowers below. I would say it’s fully opaque in two-three coats, you see two below over red. Thank you for reading and I hope you liked the review and try this brand. It is definitely worth your money from start to finish and they have a wide selection of shades so I’m sure you will find the perfect one for you and their prices are really good ! Thank you Black Dahlia for trusting me with your product and congratulations on this collection! 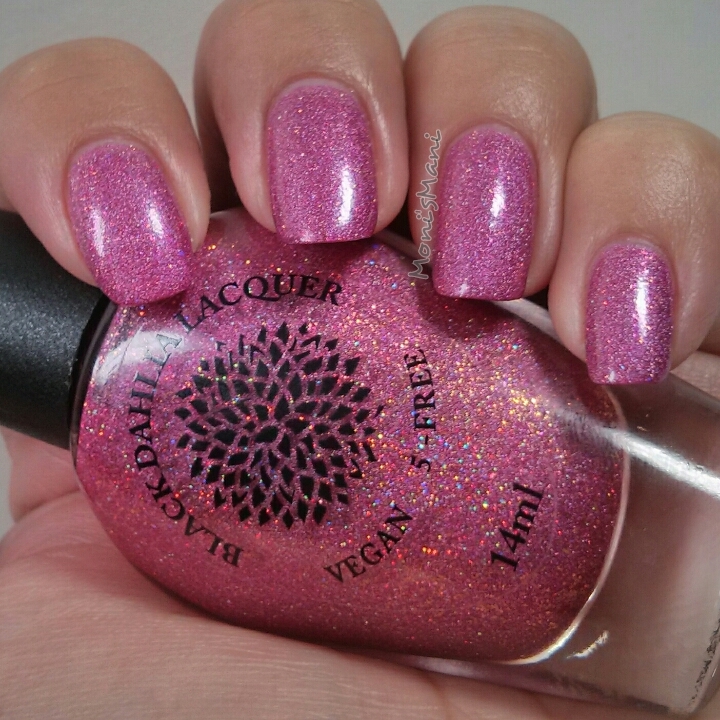 Did you know that Black Dahlia lacquer is a hand-crafted, vegan, and 5-free? They are also certified cruelty free. 15OFFHOLIDAY 15% off holiday collection expires at midnight Dec 07. Beautiful swatches, my dear! <3 I'm with you on Vibrant Poinsettias, holy crap, so gorgeous!!! And that wrapping paper is amazing! Aww thank you Kirby!! Means a lot coming from you! !